Tower Grove Park has been a St. Louis treasure for nearly 150 years, a backdrop for countless family reunions, festivals, sporting events, and more. Park officials recently unveiled a new master plan outlining major facility and recreation upgrades in the next 20 years. It builds on the original vision for the park laid out by Missouri Botanical Garden founder Henry Shaw. His was a vision that, if carried out to its full extent, could have created a much different park than we all know today. Mr. Shaw gave Tower Grove Park to the city of St. Louis in 1868, and it would open to the public a few years later in 1872. Despite giving up ownership, Shaw sat on the park’s board of commissioners and was instrumental in its planning and development. Many of the features seen in the park today were put in place under his direction, including the stone entrance gates, the gazebos, and the pond with its iconic ruins. Other projects, like a hedge maze and observation tower, no longer exist in the park but have been recreated on Garden grounds. And one park proposal never made it much past the planning stage. The Lands of Henry Shaw around Tower Grove, circa 1872. Notice the “Reserved Strip” along the perimeter of Tower Grove Park. 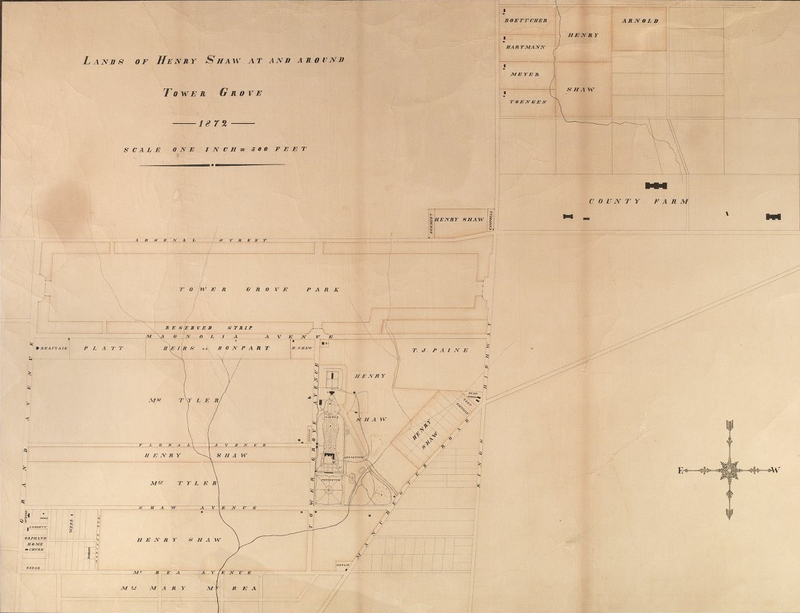 The original plans for Tower Grove Park included a 200-foot wide “reserved strip” along the park boundaries. It was intended for a row of villas — a design popular in Shaw’s native England. The idea was to rent out the land itself under long-term leases to be renewed every 30 years. The accompanying rent would act as a source of revenue to support the Garden. Although popular in England, Americans weren’t keen on the idea and the plan was abandoned. Mr. Shaw offered to release the strip to the city on the condition an iron fence be built around it, similar to the fence around Lafayette Park. Officials refused, and a lengthy court battle ensued over the future of the property. Nearly 50 years after it was first proposed, Shaw’s two-hundred-foot strip was turned over to the city in 1925 in exchange for $500,000. Although the villa concept failed to take off, the “model home” for this scheme still exists today. The home was completed in 1869 on the southeast corner of Tower Grove and Magnolia Avenues, for a cost of about $11,000. The two story home combines elements of neoclassical and Italianate styles popular at the time. In addition to serving as a visual enticement for other potential villa owners, the home was intended as a residence for the park superintendent. James Gurney, chief gardener for the Missouri Botanical Garden, would be the first to take up permanent residence in the home in 1895. Three generations of the Gurney family would live there while serving as superintendents of the park. There is another home along Magnolia Avenue that bears some mention here, although it was not part of Shaw’s original setback. This other parcel of land, south of Magnolia from Kingshighway to present-day Alfred Avenue, was under different ownership at that time. This home was therefore not part of the planned villas. It was built in the early 20th century, and the city would acquire this final parcel of land a short time later. The Magnolia Residence, as it is known among park employees, would remain a private home for decades (former residents include a group nuns from the St. Louis Archdiocese). The nearly 150-year-old park is about to undergo a big transformation. The recently released master plan calls for new trails, natural areas, and other enhancements. Shaw’s old reserved strip will see new attention to its athletic fields, and the addition of sand volleyball and basketball courts. The Superintendent’s home, no longer a residence for the park director, is envisioned as a wedding and event venue. The master plan also considers several possibilities for the Magnolia Residence, either as new office or classroom space, or as a potential new home for the park director. Despite changes on the horizon, the master plan pays equal attention to preserving the park’s existing historic significance. Although his villas didn’t pan out, the spirit of Shaw’s vision for Tower Grove Park is in evidence and will surely endure for generations to come.